Our Gold sleigh is filled with so many goodies! 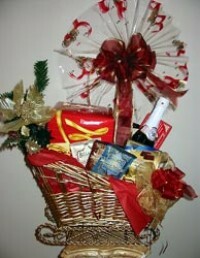 We have put panettone, cookies, chocolates, candies, cocoa, tea and coffee, and topped with a bottle of sparkling cider. The best thing about giving one of these sleighs is that when the goodies are gone, the sleigh can be used for many years under the tree to hold presents. As you can see it makes a gorgeous gift that is sure to WOW! the recipient.